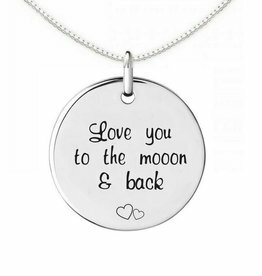 Beautiful through-and-through silver necklace with a beautiful text that confirms the love between Mother and Daughter. The hangers are pre-engraved, so delivery in one day! Including Necklace & Coin & Pareltje. 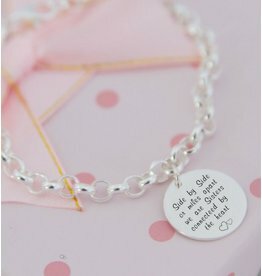 Two beautiful through-and-through silver necklaces with a beautiful text that confirms the love between sisters. The hangers are pre-engraved, so delivery in one day! Including Necklace & Freshwater Pearl & Coin. 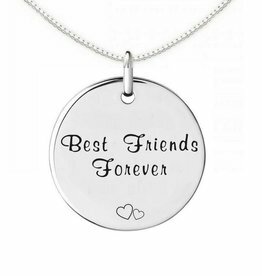 Beautiful through-and-through silver necklace with a beautiful text that confirms the bond between sisters. The hangers are pre-engraved, so delivery in one day! Including Necklace & Mint. Make your ornament extra special by an engraving on the back. Tanja engrave by hand, with a special engraving. Dear symbolic necklace for your daughter, loved one or for mom. The pendant has a big heart and processed a little heart, a symbol of your love. Both the chain and the charms of .925 silver, forever beautiful. Beautiful through-and-through silver necklace with a beautiful text that confirms the love between mother and child (ren). The hangers are pre-engraved, so delivery in one day! Including Necklace & Mint.